Eola Hills Wine Cellars recently turned 30 years old. What started as a well-developed curiosity for an insurance agent has grown into an internationally distributed label with six vineyards, 100 planted acres and an annual production of 93,000 cases. Eola Hills Wine Cellars founder Tom Huggins (left) with his daughter, Kylie Huggins, and longtime winemaker Steve Anderson celebrate the 30th anniversary of the winery at the Rickreall headquarters. 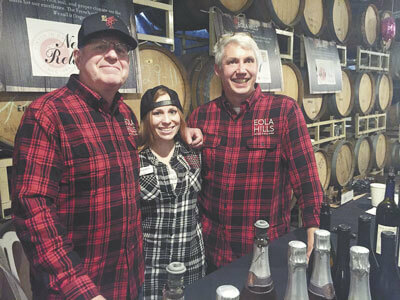 To mark the landmark anniversary, the family-run winery hosted a celebration Nov. 5 at its tasting room in McMinnville and, of course, at the winery in Rickreall, where the brand has been growing since 1986. Walking into the party in Rickreall, I felt like a teenager again — I was 15 in 1986 — as ‘80s dance music thumped inside the entrance. A classic slow dance number from Toto — I think — echoed off the high walls, as colored lights drifted lazily across the ceiling. Immediately, I had flashbacks to school dances, and in every corner of the packed room were people of similar age, some of them dancing long-forgotten moves from decades past, others simply standing, enjoying glasses of Pinot, Chardonnay and Tempranillo. Weaving through the crowd, I made eye contact with a smiling woman in an Eola Hills ball cap. She was Kylie Huggins, national sales manager and daughter of owner Tom Huggins. Over the din of Tears for Fears, she led me to her dad, working a tasting table with his winemaker, Steve Anderson. Huggins explained how his work in insurance introduced him to the world of winemaking. He was addressing Mei Wong, an exporter for Royal Comfort, in town to work with Huggins as they prepare to travel to China, promoting the brand now in its second year in the prospering country — Eola Hills is one of 11 Oregon wineries to crack the Chinese market. While they talked, I moved through the crowd, feeling the ambiance of the celebration. And as A-Ha’s “Take on Me” filled the air, I noticed the place looked and sounded like a high school reunion: All the people seemed familiar, but I couldn’t identify any, while every song shook loose a memory. A slideshow of scenes over the years from the winery played on the wall, while a group of women in their mid-40s bounced in from outside and immediately started dancing as if Reagan were still in the White House. Kylie Huggins caught up to me, handing me a glass of Pinot. Before long, I found myself telling the Millennial at the Tillamook cheese table why the current song, Van Halen’s “Hot for Teacher” was the best music video ever produced. He nodded awkwardly, smiled and scanned the room. After some excellent samples of sharp cheddar, I set out to find Stephanie Bobb, Eola Hills’ special events coordinator and the brains behind the party. Like in high school, I found myself regaling people with random observations while milling through the crowd looking for a girl — it felt surreal. Along the way, I ran into the group of women and struck up a conversation. It turned out they’re a group of longtime friends who meet to drink wine once a month. Circa 1983, Oak Grove Vineyard, Eola Hills’ first site planted in 1982. (From left) Jim Huggins, vineyard manager and brother of founder Tom Huggins, two local helpers and John Wydronek, current shareholder and friends of the Huggins family, help with the harvest of Chardonnay. They were having a blast, aided by the fact that one had brought along her teenage daughter as the designated driver, who looked “thrilled” with her role. The women were guests of a friend, an employee at the winery. “Do you know her? Her name is Stephanie!” shouted Denise Lewis, while Rick Astley materialized up in the background. “I’m looking for Stephanie,” I shouted back. “The Chardonnay is really good,” offered her fellow reveler, Leslie Boyd. It turned out the ladies already had been through the barrel room, where they were afforded samples of select wines. Much more than just a nostalgic party, the celebration also offered tours of the vineyard and cellar, as well as the grounds at the winery, which include such destinations as Legacy Lake, Legacy Sanctuary and Legacy Barn. Bidding the ladies goodbye, I waded back into the crowd to seek out Bobb. When I found her, we both made the connection and cheered simultaneously — it must have been my notebook held awkwardly in the same hand as my wine glass that gave me away. With only two months at her post with Eola Hills, Bobb laughed when she learned I’d bumped into her friends; she agreed within the context of her wine group, she has a good gig. “It’s just the best job I could imagine,” she said. And with those words, the high school reunion vibe returned as she remarked on what she originally set out to do with her life. From the looks of the party she’d thrown, the career change worked. It was around 4 p.m., and the party had already banked $10,000 in sales. Congratulations to Eola Hills, a party, I mean, job well done. In the years before Neil Zawicki landed in the Willamette Valley, he spent his time as a reporter in Alaska, and a sailor with an address in a California marina. In his spare time, he’s a student of history, a painter and a guitar player. TOP: Circa 1983, Oak Grove Vineyard, Eola Hills’ first site planted in 1982. 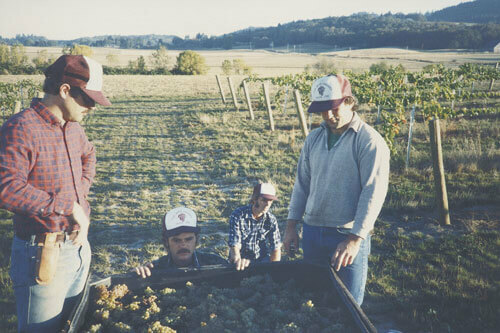 (From left) Jim Huggins, vineyard manager and brother of founder Tom Huggins, two local helpers and John Wydronek, current shareholder and friends of the Huggins family, help with the harvest of Chardonnay. ABOVE: Eola Hills Wine Cellars founder Tom Huggins (left) with his daughter, Kylie Huggins, and longtime winemaker Steve Anderson celebrate the 30th anniversary of the winery at the Rickreall headquarters. To read the full article in Oregon Wine Press, click here.